Kerry weathered a storm in Kingspan Breffni before turning on the style to make it two wins from two after this exciting, hard-hitting clash. The Kingdom have Sean O'Shea to thank for continuing their 100% record as the Kenmare youngster booted over a whopping 0-12 (9f, 45) in a virtuoso individual performance. 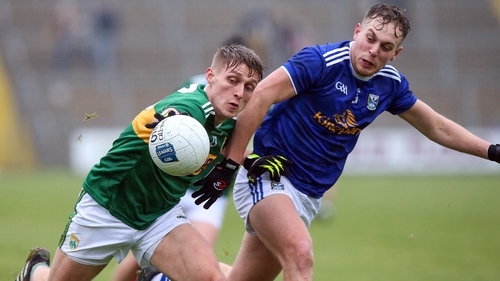 Cavan, who also bossed the first half for long spells against Galway a week earlier, turned in one of their best halves of football in recent years to go in leading by 0-11 to 0-7 at the interval, with just one point of Kerry's total having arrived from play. Mickey Graham's side eased into a 0-2 to 0-0 lead through an excellent Conor Madden strike and a 45 from Raymond Galligan but Kerry responded with O'Shea's first free. The Munster men were employing a very defensive style, with all 15 players helping out at the back at times, but Cavan - with the likes of Dara McVeety breaking the line - were punching holes in that rearguard shell. Cian Mackey played Madden in for a mark which he converted to make it 0-3 to 0-1. The peerless O'Shea replied but two points from the excellent Ciaran Brady made it 0-5 to 0-2 on the 12-minute mark. And better was to follow for the hosts when Niall Murray linked up with clubmate Paul Graham - brother of the manager - to curl over another quality point via the upright. Kerry, though, refused to panic and two O'Shea frees and a 45 made it a one-point game again. Martin Reilly and that man O'Shea (from all of 43 metres) traded frees before Kerry levelled in the 26th minute when O'Shea picked out Paul Geaney, who swung in a spectacular point, their first from play. But Cavan finished the half in style with four unanswered points of their own, McVeety driving over a wonder-score from the right wing, Conor Rehill adding the next and Conor Madden and Jack Brady (mark) also registering to put four between them at the break. Kerry got off the mark with a seventh point from O'Shea - another free after a foul on lively sub Dara Moynihan - on the restart and Cavan's cause wasn't helped when McVeety went off with what looked like a shoulder injury. The visitors, with the wind at their backs, were slowly turning the screw. After O'Shea and Reilly each landed frees, Kerry struck. A majestic O'Shea point from play, one for Stephen O'Brien and another awesome score from the in-form O'Shea levelled the match again on 62 minutes. And Kerry didn't look back, Mark Griffin, O'Shea (free) and Paul Geaney adding late points before, fittingly, the last score fell to O'Shea to round off a magnificent individual performance.